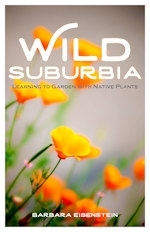 Thursday, January 26, 2017, 7:30 p.m.: Wild Suburbia: Learning to garden with native plants, with Barbara Eisenstein: In her recently published book, Barbara Eisenstein guides us through the process of transforming a traditional, high water-use yard into a peaceful habitat garden abounding with native plants. Because there are so many variables in gardening, answers to even simple questions about establishing a native plant garden are rife with caveats and exceptions. Wild Suburbia describes some of these variables so that gardeners will be better able to select the best practices for their own conditions. Those attending this talk will be encouraged to share their thoughts and experiences on horticultural practices that worked, along with those that did not. For example, how do you water your native plants? Can a drip system supply adequate hydration? What is the best way to get rid of a lawn of weedy Bermuda grass? What were some of your most surprising successes and failures? The evening will conclude with a discussion of how we, as members of CNPS, might improve the dissemination of accurate information on sustainable gardening with California native plants.